After a dismal performance in which all 11 starters were culpable, it was curious to see Kyle Bennett singled out by many for the 3-2 loss to Oldham. The on-loan Doncaster winger was certainly culpable for the Latics’ winning goal, buckling out of a 50-50 challenge that allowed the visitors to score on the counter attack. But on a day in which no one could have been rated any higher than 5 out of 10, Bennett was hardly the root cause of a defeat in which the blame deserved to be evenly dished out. Six minutes after his mistake, the board went up to signal his hook and cheering could be heard from the stands. Bennett’s recent performances had showed steady signs of improvement, and there was growing talk from some supporters that he would be worth offering a contract to during the summer – but he didn’t have enough goodwill in the bank to escape the derision. Perhaps we could do better than Kyle when it comes to rebuilding this squad, but I personally still see something there that, for now, means the jury is still out. He couldn’t really have made a worse start to life at Valley Parade, getting sent off less than 30 minutes into his debut, against Preston. And the impression he made prior to raising his hands at Neil Kilkenny was a disappointing one. At the time there had been much talk of Phil Parkinson refreshing his approach by recruiting two out-and-out wingers, instead of the tried and tested formula of one direct wideman (Kyel Reid, who had just been ruled out for the season) and one inside-right midfielder (Garry Thompson) who was relied upon to tuck inside and support the central midfielders. Yet while Adam Reach – who also made his debut against Preston that night – was a like-for-like replacement for Reid, albeit lacking pace, it quickly became evident that Bennett was no direct winger himself, and would take on the Thompson role from a player who for several months had struggled for confidence. Bennett picked up possession out wide: but rather than trail past defenders and charge to the byeline, he would cut inside and into the more congested centre of the park. Oh…right…we didn’t expect that. It was not hard to remain underwhelmed, as Bennett returned from his one-match ban and carried on in the same vein. You’d see people screaming at him to take defenders on and hog the touchline, but that was either not his game or not what his manager was instructing him to do. Our expectations had to change, because here was a player much more Will Atkinson than Kyel Reid. Yet as City’s season settled down after the ‘one win in…’ run finally came to an end, Bennett slowly but surely began to impress. He has ability on the ball and can pick out a good pass; he possesses good energy levels that see him get up and down the pitch well; and his link up play with the front two enabled one of City’s central midfielders to get further up the park in support. Industrious, intelligent and, increasingly, influential. A superbly taken goal in a 2-0 victory at Colchester was Bennett’s high watermark. The downside is that Bennett is rarely going to leave you hanging on the edge of your seat. He is not on out-and-out flair player who is going to win football matches on his own, and he is probably not going to be someone you immediately look to when the chips are down and inspiration is required – more likely, and it is proven, he is the first player to be subbed. Bennett is the support act, not the headliner. Managers love this sort of player; fans sometimes shrug their shoulders and wonder why he is in the team. It is no surprise that there has been a recent pining for Thompson to come back into the fold, because the 33-year-old has proven in the past that he has more of an end product than Bennett has thus far shown. Yet Thompson himself spent the first half of the season as the scapegoat for the team’s failings, and with many fans urging Parkinson to quickly replace him. Bennett might not be enough of an improvement, but much of the frustration lies in a misunderstanding from some of the role these players are asked to perform. And three years of Parkinson at the helm suggests he will continue to recruit this type of player. In his year one, Craig Fagan played the wide-midfielder-who-tucks-inside role, after Parkinson quickly ruled that Chris Mitchell wasn’t up it. When Kyel Reid, on the other side, suffered a bad injury in December 2012, a range of loanees were brought in to fill the direct winger void but struggled to impress. Andy Haworth, Charlie Taylor and then – in one of the worst debuts I have ever seen – Will Atkinson, who looked awful in a 2-1 defeat at Bristol Rovers. Yet while Atkinson was no Reid and did nothing during his four-month loan spell to suggest he could be the player who – a year later – would be walking out for Bradford City at Wembley to face Swansea City in the League Cup Final, Parkinson saw enough in him to believe he could perform the wide-midfielder-who-tucks-inside position (in competition with Thompson). And so Atkinson was offered a permanent deal during the summer, and became a first team regular for the middle half of the season. Atkinson was simply outstanding in the League Cup successes over Arsenal and Aston Villa. I can still picture his box of tricks against Arsenal that had international defenders flummoxed. 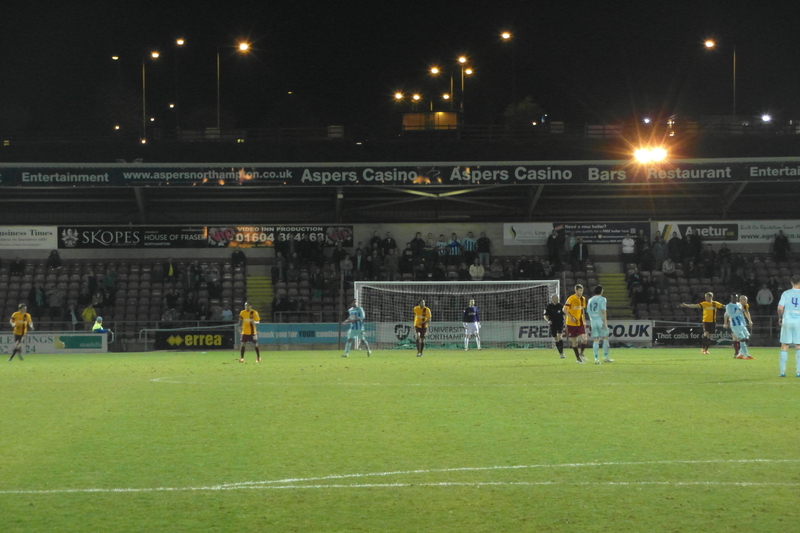 On that cold December night, where City found success playing two banks of four, Atkinson was a hugely important figure in the shock Bantams’ victory. The lesson here, of course, is that, Bennett’s less-than-perfect loan spell audition for this role does not mean he isn’t the answer. There is every chance he could be 2014/15’s Will Atkinson. The two players are remarkably similar in style and technique, and there is little doubt that Parkinson is going to be in the market for one or even two of these players during the summer. For Bennett, who has another year’s contract at Doncaster but is out of favour, you would assume he would jump at the chance to be at Valley Parade next season. But then, we come back to the non-tackle against Oldham. Watch it back (see above, two minutes in), and you cringe at his feeble attempt to win a challenge that, positionally, he would have been favourite to emerge victorious from. He couldn’t have known that in less than 10 seconds the ball would be in the back of his team’s net, but the angry team mates he faced had every right to let their displeasure known. Bennett let down the team on a day when the whole team let down the club. And as that board went up for his withdrawal and the cheers began, there went his opportunity to make up for his error. Some people blame his lack of courage on his loanee status. He didn’t care, we aren’t his club, he’s not going to put his body on the line. I don’t agree with that call, and I think that he deserves the benefit of the doubt. Whether he sees his future in West Yorkshire or elsewhere, Bennett is playing for his future. He is, in effect, an out-of-contract player looking for his next deal. There will be hundreds more like him in the queue come the summer, and he knows that. I think his indecision was more a case that he is not the type of player to get stuck in. He is not the sort to fly into challenges. And what’s more, there are other players at City who are the same. Would Kyel Reid have gone into that tackle, for example? What about Reach? The strengths of Bennett – and Reid and Reach – lie elsewhere. They are ball players, not ball winners. Alas for Bennett, not being that type of player could determine his fate at City. For while Reid and Reach can get away with that, playing the out-and-out winger role, Bennett is auditioning for that wide-midfielder-who-tucks-inside position that demands defensive ability as well as attacking. Bennett’s positioning has been good and he can disrupt opposition attacks; he also provides his full back with good protection. But this role requires more than just that good positioning. If Bennett cannot tackle and, therefore, cannot be relied upon to stand tall in moments such as the one against Oldham, then he probably isn’t the man for the job. So over these final five games, Bennett has the opportunity to disprove that. To show that his below-par performance against Oldham was part of a team failing, not a cruel exposure of his personal weaknesses. The next time Bennett faces up to a moment where he needs to put a foot in, he had better not duck out. I like Bennett, and with his attacking skills I can see him prospering at Valley Parade; but it’s down to him to remove those lingering doubts over the next five games. It’s down to him to show that he can win a contract by winning the ball. ‹ Smells like Team Spirit? I think the talk around Saturday’s incident is pretty unfair on a very good player. Firstly, he wins the ball quite a lot through pressing and interceptions, probably a lot more often than some of the players we might consider to be natural ball-winners. It’s difficult to measure a player by what doesn’t happen, but how many opposition breaks or openings have never come about because Kyle Bennett got to the ball earlier in the move? Also, you don’t actually need to win the ball to seriously disrupt an attack, you just need to make the player with the ball think twice and look for another route. Secondly, our players are professionals and see game in a completely different way to fans. Whilst they will have been angry to concede a goal, we have to understand why a player who’s out of contract in a few weeks would be extremely reluctant to risk injury in a 50-50 challenge. Thirdly, a wide player coming inside with the ball is hardly a problem, provided that other players know how to work with that. The issue is that McClean also moves towards the ball and we really need him to make runs that stretch the play. That’s why it gets so congested. It’s interesting that the recent debate has focused on a perceived lack of commitment or motivation in our players, because as I see it we’re mostly suffering from a lack of ability in this post-Nahki era. Bennett is a player who has that ability and could be a really key player in next season’s squad. I like this assessment of Bennett and agree with the need to appreciate what he is being asked to do, given Parky’s preference for tasking his wingers with different jobs. On the broader point about commitment from loan players, the footage at 2mins is damning of Bennett, and it’s hard to watch him pulling away from a collision that allows Oldham to break. In such split-second decisions, games are won and lost – though we hardly deserved anything from Saturday. I am not a fan of having loan players in the club and continue to admire Parkinson for building a ‘special spirit’ in the dressing room and the stands. Contrast this with the footage at 3mins, however, when Jon Stead puts his head in to knock the ball on and thus contribute to our consolation goal from Jones. Stead gets whacked hard but proves that loan players can be committed to the cause. Likewise Yeates has shirked far too many tackles for my liking, yet he was a signature 2 year signing for us in the summer. Perhaps the point about commitment has as much to do with temperament and personality as contract status? Sorry to correct you but it was Oli McBurnie who put his head in where it hurt for the goal, not Stead. I do think Stead looked committed though. Oh maaan! Does this mean I have to go play with the T&A message board now?! I wouldn’t wish that fate on anyone – stick around! Bennett is not playing for his immediate future as he still has a year left on his contract at Doncaster ! Thank you Darron, I have fixed the copy.